Dental wear could occur as a normal physiological process that can be observed both in primary and permanent dentition as a consequence of mandibular conduction phenomena but often could be a pathological process due to the repeated action of risk factors. Aims of the study: To establish prevalence, severity of lesions and to identify possible risk factors associated with dental wear. Material and method: The present study was conducted on a sample of 456 children (6-11 years old) from several schools in rural and urban areas. A visual inspection of teeth with completing an examination sheet in accordance with BEWE index was performed. Also, a parent questionnaire was completed. 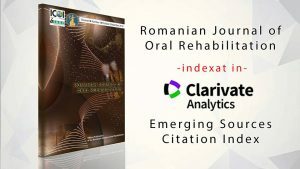 Results: The prevalence was 32.46%, especially in primary dentition, with higher values in the urban area (84.5%), among the group of male children (54.05%) and in the group of 7 years old (33.11%). The possible risk factors were also identified following the analysis of the questionnaires. 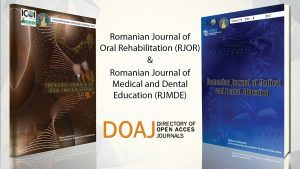 Conclusions: The study encountered a high prevalence of dental wear in children associated with a number of aetiological factors and established that, from an early age, children have access to energy drinks and carbonated beverages.